I got the call in the afternoon, it was a stage hypnosis emergency! My friend, Mariana Matthews (That Lady Hypnotist) had a show that evening, and her usual soundperson was ill. She asked if I could run the sound cues for her at the show, and I thought I’d use the experience to take you behind the scenes of a stage hypnosis show. Now, a lot of folks in the therapeutic end of the field, don’t like stage hypnosis. Me? I say, it depends. 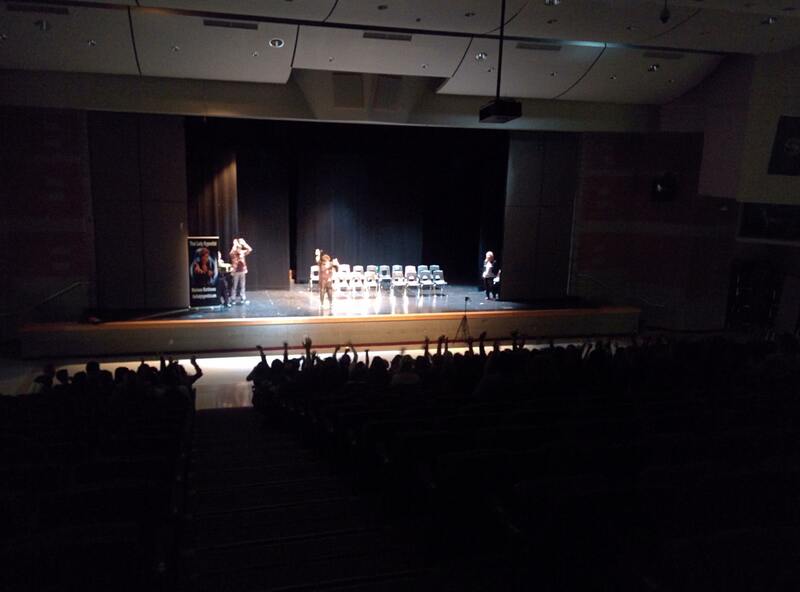 Stage hypnosis can show people the power of hypnosis, and make them curious to learn more. Some of them later seek out a hypnotherapist. Presented poorly though, and it can scare people or make folks think hypnosis is about making people do things against their will. It all depends on how you present it. This show was for a high school. Needless to say, it was not a ‘blue’ show, and the safety of the people involved was a top consideration. 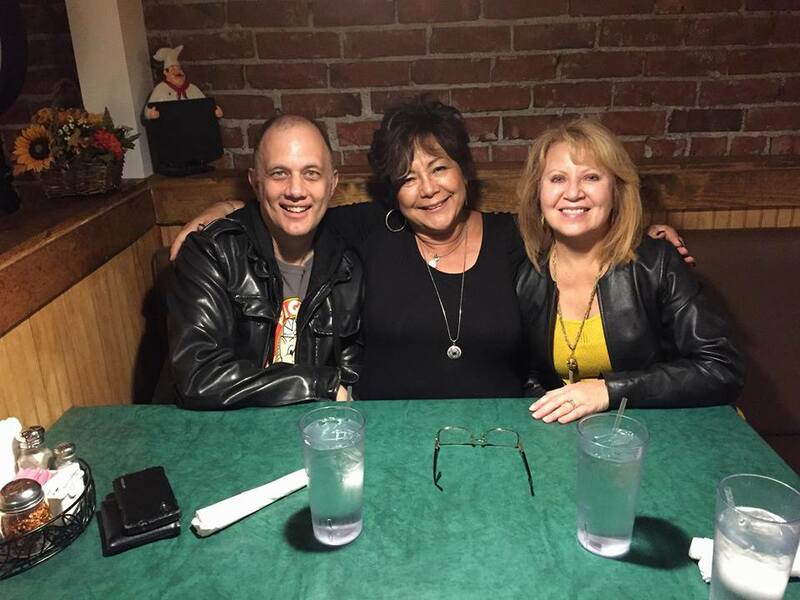 I met Mariana at a stage hypnosis training several years ago, and when we found out we were both in the Seattle area, we became friends. Mariana was working with Patricia Eslava Vessey, who is not only an experienced hypnotherapist and life coach, but has conducted hundreds of live events, and has it down. We got there early. Mariana and Patricia talked to the organizers, and set up the chairs and a camera. Props were pulled out and placed properly. I scoped out the sound booth, which was quite a ways from the stage. 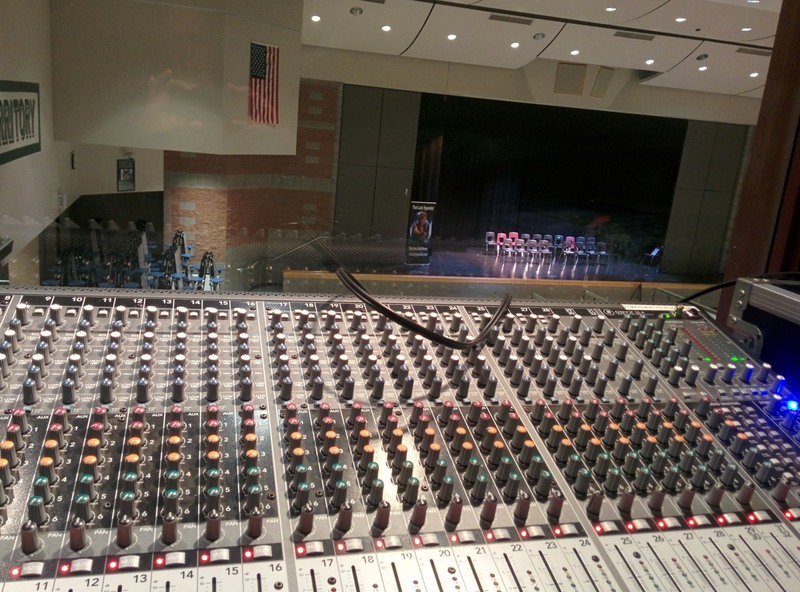 The show was in an auditorium, and I was up in the sound booth. 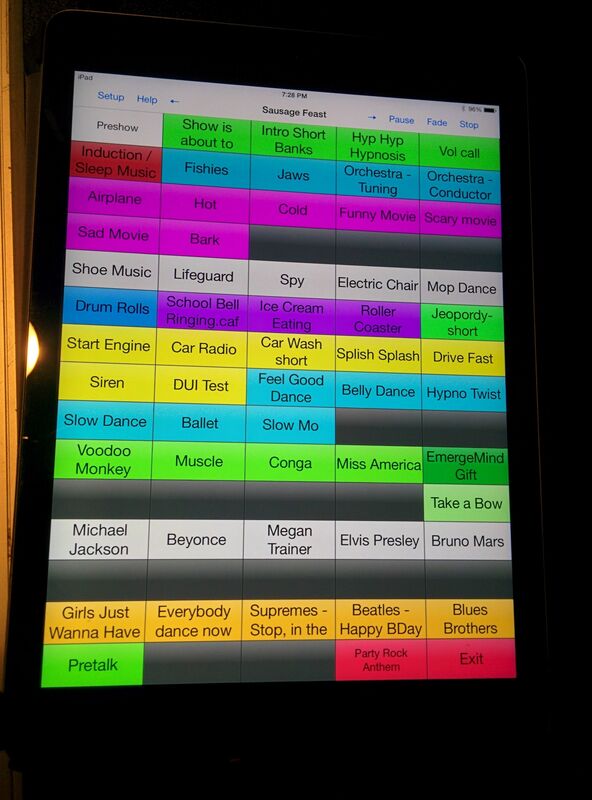 A tech person from the school plugged the iPad in for me, and showed me what knobs controlled the volume. 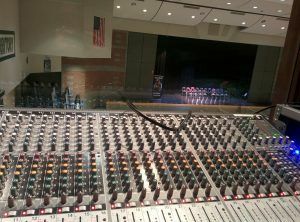 We checked everything out to make sure the levels were OK.
My job was to listen to the show, and play the sound cues at the right time. The sound cues were on an iPad, and all I had to do was listen to the show, and when Mariana said, “Now, you’re watching the funniest movie you’ve ever seen”, I hit the button that said “Funny Movie”. Truthfully, it was a bit nerve-wracking, as the cues had to be exact — and I missed more than one. There were somewhere around 40 sound cues in the show. But Mariana is a pro, and very little phases her. I hit the majority of the cues, and the show was a big success with the audience. There were skits about it getting hot and cold, watching funny and sad movies, driving a car, and seeing someone you thought was attractive (and then seeing someone you wanted to avoid). People danced, laughed, sang, and generally had fun. My favorite bit is where Mariana suggests that a volunteer’s name is E-I-E-I-O, like in the song, ‘Old McDonald’. When she asks them how they spell it, they usually say, with some exasperation, “Eeeee-Iiiii-Eeeee-Iiiii-Oooooo’. That usually gets a pretty big laugh. Marina likes to give a ‘mind gift’ at the end of the show. It’s basically a few moments of suggestions that people do well and achieve success through the power of their minds. It’s a nice touch. Patricia ran a skit herself, and since there were no sound cues for that portion of the show, I was able to run down and get a picture (I blocked a few of the kids faces out, to protect their identities). Is Stage Hypnosis ‘Real’ Hypnosis? It’s volunteers. You hypnotize people that genuinely want it. There’s social encouragement to do well. Volunteers hear applause, so are rewarded for getting into it. There’s fractionation. People are brought in and out of hypnosis repeatedly. That tends to deepen trance. Volunteers know what’s expected of them. Positive expectations tend to build success. The progression of skits deepens trance. Usually the skits progress from hypnotic phenomenon that are easy to produce, to deeper hypnotic effects. The early success builds confidence, and deepens trance. Note that some of these factors increase the odds of a good, active show — but not necessarily the deepest trace. Sometimes you get a volunteer who just sits there during the skits. They may be following along in their minds, and deeply into the scenario, and deeply in trance. They may even think they’re participating. It’s like a dream, where you think you’re running. But that doesn’t make for the best stage show. So, it’s a good idea to emerge those folks and politely suggest they enjoy the rest of the show from the audience. In this show, there was one fellow that was so deeply hypnotized, he didn’t want to emerge. Mariana took a few minutes and emerged him again, with suggestions of well-being. In short, the three of us had fun, everybody made a little money, some money was raised for charity, and everybody was happy!